UV-curable palm oil-based alkyd coating is a form of environmentally friendly coating that utilizes vegetable oil as one of its main raw materials. Similar to any other coatings, UV-cured alkyd coating is susceptible to damages such as formation of microcracks during its service. Early diagnosis and repair of the damage are important to avoid further catastrophic failure and damage to the substrate. Self-healing ability in coating is therefore a desirable quality and has gained popularity in the industry as it can prolong the lifetime of the coating, as well as the substrate. 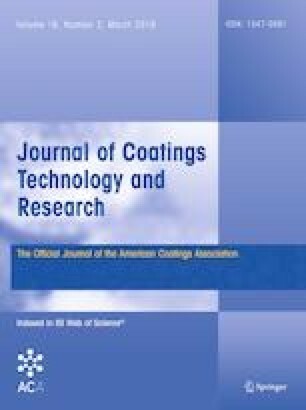 The aim of this study is to produce UV-curable alkyd coating with self-healing ability. The coating is a form of environmentally friendly self-healing coating owing to its UV curing ability and also due to the fact that the binder is produced using a significant amount of a renewable resource, palm oil. The self-healing alkyd coating is comprised of microcapsules containing healing agent, embedded into alkyd coating matrix. Diglycidyl ether bisphenol-A-based epoxy (EPON828) and pentaerythritol tetrakis (3-mercaptopropionate) were chosen as the healing agents in this work due to their compatibility with the matrix. Self-healing process of the coating takes place within 10 min after the coating was intentionally damaged. The efficacy of the self-healing ability of the coating was investigated using electrochemical impedance spectroscopy measurement. The online version of this article ( https://doi.org/10.1007/s11998-018-0124-x) contains supplementary material, which is available to authorized users. This work was financially supported by the Ministry of Science, Technology and Innovation (MOSTI), Malaysia, through research grant SF006-2015. Sigma Aldrich, N,N-Dimethylbenzylamine, Material Safety Data Sheet, 2012 [cited 2017]; http://www.sigmaaldrich.com/catalog/product/aldrich/185582?lang=en&region=MY. Sigma Aldrich, Pentaerythritol tetrakis(3-mercaptopropionate), Material Safety Data Sheet, 2015 [cited 2017]; http://www.sigmaaldrich.com/catalog/product/aldrich/381462?lang=en&region=MY.